I don't know about you, but I always end up with a box of scraps that sit there and glare at me for years until I give up and throw them away! Here's and idea to finally get rid of some! This card was made using paper weaving. I cut an aperture in a separate piece of white card using a Spellbinder die (saving the cut out of course!). Next, cut the paper into strips of various widths. Attach a line of double sided tape to the top of another piece of card that is slightly smaller that the top aperture layer. Start sticking a line of the papers onto the tape. When you get to the other end, weave the papers in and out horizontally. Place the aperture over the top. To finish the card, I stamped and embossed a butterfly onto vellum. Cut out 2 more dies in black and white and stamped a sentiment onto the card. This one hasn't been made from scraps as it's for a workshop and I wanted everyone to have the same paper but it was paper that I didn't like and would never have used so it still counts! 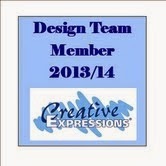 All the stamps and the set of dies are from Creative Expressions. I'm up to my neck in gilding flakes at the moment making samples for Ally Pally. My biggest problem is that in my studio I have a wall mounted heater that blows out warm air. I have to wait for it to go off before I remove the lid from the flakes......timing is all!!! Right, better get back to the studio, lots more demo ideas to prep. Please remember to leave comments to be in with a chance of the blog candy. The post with how to enter is further down.